Finally, a working all in one solution to jailbreak iPhone 4, 3GS, iPhone 3G, iPod Touch and iPad has arrived. Jailbreakme 2.0, the new jailbreak tool released by Comex can be used to jailbreak all most all iOS 4.0 devices without any hassle. 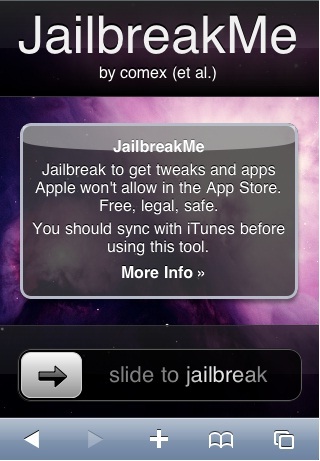 The jailbreakme 2.0 for iPhone 4, 3GS and 3G is a userland jailbreak. That means here the iOS jailbreak is done online, and the user doesn’t need to download and install any software to their computer. As we all know, jailbreak, unlock and rooting is now legalized in USA. Therefore with Jailbreakme it is possible to get Apple blocked features in iPhone, iPod or iPad and install unapproved apps using the Cydia installer. Jailbreakme 2.0 for iPhone 4, 3GS, 3G, iPod touch and iPad. Jailbreakme works with all idevices. However, iPhone users should activate their device before proceeding to the jailbreak. The first step is to download the latest version of iTunes. After this, sync your iPod, iPhone and iPad with iTunes and backup all the data available. Open Safari web browser and go to this link or this. It will load a page something like as shown above. Now move over the slide to jailbreak button and proceed to jailbreak process. The Cydia installer will be added to the home screen of the device after completion of the installation. Sometimes it will show a blank purple screen. It indicates that the server is on over load. Please wait a few hours to get into your slot. Its very simple to restore iPhone or iPod the old iOS version after jailbreaking it with jailbreakme 2.0. Just download iOS 4.0 or 4.0.1 and use the installation instructions to complete the process. Use iTunes to restore this firmware. actually i have iphone 3gs and i uploaded my phone’s firmware software with 4.1 and it was downloaded successfully but thenafter i got one problem in it, my mobile carrier was lost and none of the sim cards were worked at that time. so then i uploaded my original software but it got locked and it’s showing(plz enter sim card with no pin number to activate i phone) totally confused what to do now? i need ur instruction on this? please help me? Ma phone has got a problem.. It was working well for few days after jail breaking.. But suddenly the home screen isnt been displayed. and also the phone is not detected in itunes..
Is the cause of the problem is jail breaking? ?